Durham Amateur Rowing Club is set in a stunning location on a bend in the River Wear, opposite Pelaw Woods, and at the end of Green Lane, Durham City. There is approximately 2 kilometres of navigable river from the footbridge at Maiden Castle to the weir beyond Prebends Bridge. With many bends, several bridges (including the narrow arches of Elvet Bridge, part of the ‘long course’) and some steeply wooded banks, the river meanders through the heart of Durham City. It’s an idyllic, if at times rather crowded stretch of water. The ‘new’ clubhouse was officially opened by Roberta Blackman-Woods MP on 14th September 2007 after many years of grant-seeking, fundraising, design and re-design, and numerous planning applications – all persistently led by our long-term secretary Barry Hudson. This is our third ‘new’ boathouse. 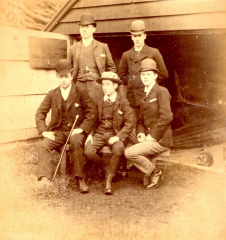 The first ‘new boathouse’ was completed in 1897 at a cost of £296 on a site close to the weir, near PrebendsBridge. You could get a pair of sculling blades for that today! The club also hosts a Dragon boating club, and a Power lifting section. We are constantly battling a number of difficulties with our stretch of river: the silting up creating dangerous shallows which require regular dredging; the increasingly common floods – (see River Webcam) needed to monitor the yoyo river level, the erosion of the river banks, and the blocking of the river by falling trees. There is a constant need for new boats and equipment if our rowers are to compete at a high level and we are seeking Sponsors who would be interested in partnering with the club.